The PermeCapture™ system combines the advantages and versatility of StormCapture® precast underground storage modules with the aesthetics and performance of Belgard® permeable interlocking concrete pavers. 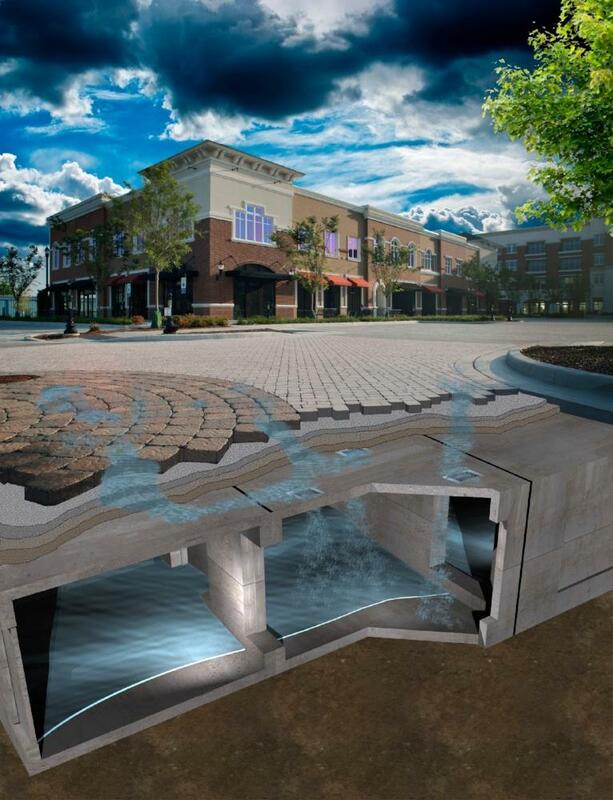 The PermeCapture system reduces peak stormwater flows and provides runoff reduction at the source. System applications include stormwater retention and harvesting, detention, and ground water recharge. Permeable interlocking concrete pavers are used to filter stormwater as it falls on the permeable surface and percolates down through the pavers and into a series of StormCapture modules. Manufactured by Oldcastle Infrastructure, A CRH Company, the structural precast concrete modules allow for controlled management of the water which can help prevent storm drain overloading, recharge groundwater supplies, or be used for stormwater harvesting. To learn more about the PermeCapture system, including specifications and features, visit the Oldcastle Infrastructure website.